Animals have friends. Cows have groups of friends and mutually groom one another. 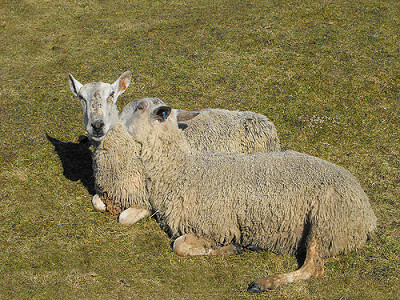 Sheep also have special friends, like these two Blue faced Leicester sheep. Although it is obvious to many people who have contact with animals on a regular basis, such as those who enjoy the company of companion animals, that animals form friendships with one another and members of other species scientists often remain sceptical until research is carried out. Research in this areas is beginning to attest to the fact that animals form friendships, many in ways perhaps unique to their species but also in ways very like ourselves. Recent research has determined that at least five species of animal are able to form friendships comparable to humans including dolphins, primates, elephants and certain carnivores and now added to that list are bats. The group of bats studied were wild Bechstein's bats. Although the males are solitary it has been observed that the females maintain long term humanlike friendships with specific individuals while maintaining loose ties with all members of the colony. They roost in the same bat boxes and tree cavities and communicate with one another, make group decisions where to communally roost and groom each other despite the chaos of day to day living. Furthermore these friendship just like ours are maintained over the years . Female bats also act as midwives. Their is a reported case of an unrelated female bat who hugged and groomed a pregnant bat through the birthing process. Not only do these findings show that bats like us are sentient beings capable of forming friendship but it also shows that small brained animals are also capable of forming friendships in the same way as animals with larger brains. This is an important discovery which may negate the theory that humans evolved large brains to become a dominant species because of the need to maintain relationships in an ever-changing social setting. It has now to be considered that other factors may have played a role. It is now obvious that perhaps smaller brained animals may actually excel us in their ability to maintain friendships. Meredith Bradshaw, a beginning graduate student, in her quest to find evidence of friendship in Giraffes began to look for evidence in Atlanta zoo, the zoo was about to send away its male Giraffe who had shared the same enclosure with two females, neither of whom had ever been pregnant. A reaction as a result of the separation was not expected. However there was a significant reaction in that the two females increased the time they spent licking the fence of their enclosure and pacing back and forth all indicators that something is wrong. 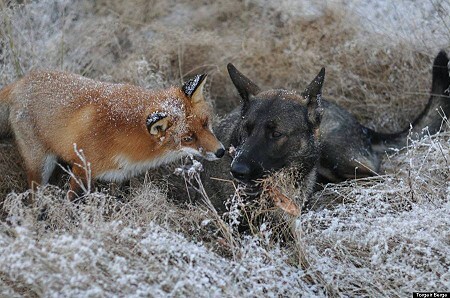 Animals often form friendships with members of another species even humans. Bella a dog and Tarra an elephant live at Elephant Sanctuary in Hohenwald, eight miles south of Nashville in the USA. When Bella came to the Sanctuary in 2002 a bond quickly developed between the two unlikely companions. "I suspect that small vulnerable little animal brought out a maternal instinct in her, and hence there was a match made in heaven," said Richard Atkinson of the Elephant sanctuary. Sadly Bella died probably as a result of an attack by coyotes. Tarra found the body of his friend and carried her with his truck to the barn where the two spent most of their time. Tarra turned to another elephant for support in her grief the way that elephants do at such times when when comfort is most needed. Tarra has according to caregivers been quieter than usual mourning the loss of her canine friend. A slideshow of the different interspecies relationships between animals. ...meet Sniffer and Tinni, a pair of best friends that met while they were both strolling through a Norwegian forest.